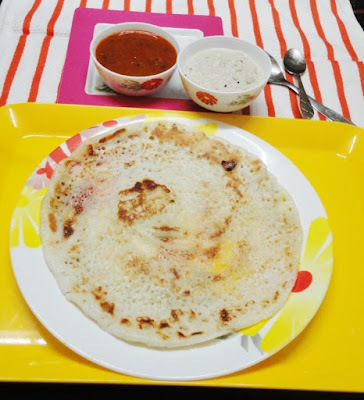 Plain uttapam recipe - Uttapam or uttapa is a signature breakfast dish of South India. This nutritious dish is easily digestible, hence making it frequently is a good idea to serve healthy and filling breakfast to your loved ones. Uttapams are served with coconut chutney and sambar. The proper proportion of ingredients, level of fermentation and consistency of batter is important to make perfect uttapams. Though the method of preparation varies slightly from house to house and restaurants, the taste is more or less identical. To make delicious uttapams, the batter needs to be fermented. The fermentation depends upon the atmospheric temperature. It takes less time in summer and more time during winter. Fermentation not only improves the texture of the dish but also makes it healthy and tasty. With the same batter other varieties of uttapam such as onion uttapam and masala uttapam can also be prepared. Uttapams are slightly thicker than dosas and it uses rice, bengal gram dal, skinned black gram dal, beaten rice and fenugreek seeds. The consistency of batter for uttapam is slightly thicker than dosa batter. These uttapams are very soft and tasty. The batter can be prepared well in advance and after fermentation it can be stored in a refrigerator for three days to make hot uttapams as and when required. Handpick the rice, black gram dal and bengal grm dal. Combine together the rice, black gram dal, bengal grm dal and fenugreek seeds. Put them together in a large vessel and rinse thoroughly using sufficient water. Soak them for 4-5 hours. After 5 hours these ingredients almost double in size. While grinding, drain water and add the beaten rice to it. Grind them in a mixer jar in batches using very little quantity of water. The consistency of batter should be medium thick and it should be thicker than dosa batter. Mix the batter well and keep it aside in a warm place for about 8-9 hours. When the batter fermented, the quantity of the batter doubles in size. While making the uttapam, add the salt and mix well. Heat a non-stick dosa pan or cast iron dosa tawa or rock tawa on a medium flame and pour 1/4 tsp oil on it. Spread the oil with spatula. Take a ladle full of batter and spread it on the pan to form a round and thick uttapam. Spread 1/4 tsp of oil around the uttapam. Cook covered on medium flame till the base become firm, flip it and cook for 2-3 minutes. Transfer the uttapam to a serving plate. 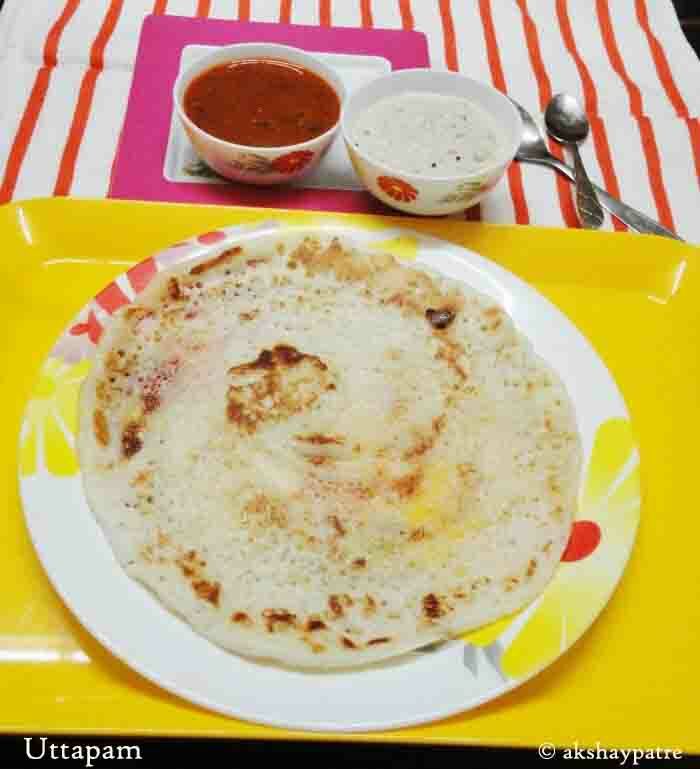 Serve the hot plain uttapam with chutney and sambar. While grinding do not add water at once. 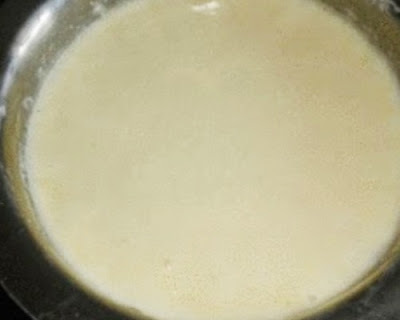 Add water gradually to make a batter of thick consistency. The proper level of fermentation is required to make soft and delicious uttapam. In warm place the fermentation takes place for 4-5 hours and in colder place it may take 8-10 hours. Once the batter is fermented well, place the batter in refrigerator to use it as and when required. This batter can be stored in the refrigerator for 2-3 days. Addition of beaten rice makes the uttapam soft, so do not skip it. Fenugreek seeds add special flavor to the dish. 1. Combine together the rice, black gram dal, bengal grm dal and fenugreek seeds. Rinse and soak them for 4-5 hours. Drain water and grind it to a medium thick batter. 2. Transfer the batter to a vessel and keep it in a warm place for 8-9 hours or till the batter fermented well. Add the salt and water to make a medium thick batter. 3. Heat a non-stick dosa pan or cast iron dosa tawa or rock tawa on a medium flame and pour 1/4 tsp of oil on it. Spread the oil with spatula. 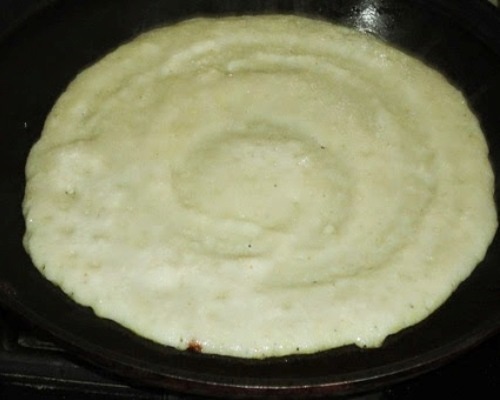 Take a ladle full of batter and spread it on the pan to form a round and thick uttapam. Spread 1/4 tsp of oil around the uttapam. Cook covered on medium flame till the base become firm, flip it and cook for another 2-3 minutes. 4. Transfer the uttapam to a serving plate. Serve the hot uttapam with coconut chutney and sambar. I make uttappam with rava and urad dal paste. I don't add rice flakes. Does it helps in making uttappam soft? I wanna try this version. Yes, rice flakes make uttapam soft. Delicious and healthy breakfast !